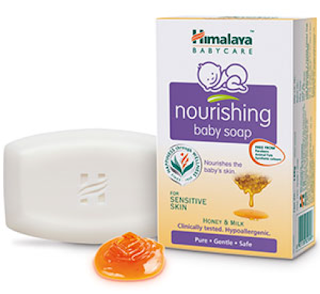 We’re back with reviewing another product by Himalaya BabyCare range and this time it’s their Nourishing Soap for Sensitive Skin. My toddler has pretty sensitive skin – prone to rashes and irritation, it even feels dry easily and have to apply lotion frequently. Even if we have itchy skin or inflammation it makes us so uncomfortable that all we want to do is apply medication and wear loose clothes. So the poor baby who cannot even express properly about the discomfort would be in so much more irritation altogether. Do note, this review is for generally sensitive skin. If you feel your baby is having skin problems all of a sudden, it’s best to first visit the pediatrician/expert before trying any product. Himalaya's Nourishing Baby Soap is an herbal formulation, especially developed for baby's sensitive skin. It contains natural emollients like Honey, Sunflower, Castor Oil and Milk that moisturizes baby's skin, and reduces itching and inflammation. Nourishing Baby Soap is free from artificial colours. • Sunflower Oil is rich in Vitamins A, C, D and E, excellent in helping baby’s skin retain moisture. • Honey is an effective moisturizing agent that nourishes baby’s skin. • Castor Oil helps reduce itching, rashes and skin inflammation. • Milk nourishes, soothes and moisturizes baby's skin. The 125g version is nice and big, definitely would last for a couple of months (depending on your usage). The soap feels creamy & silky, which makes me believe that it must have the honey & milk and oils. The soap lathers up very well and has a pleasant fragrance. Skin feels soft and not dry at all after drying with a towel. It reduces itching and inflammation, making it ideal for sensitive skin or climatic reactions. It feels great to have so many options for different skin types and ailments, all reasonably priced and easily available. If your baby has sensitive skin, then definitely try the Nourishing Baby Soap out and let me know via comments what you think about it. It’s available for purchase at here. Good blog i don't know even this soap thanks for your information.